^ See, e.g., www.amerst.com[リンク切れ], an Amherst College alumni website, among many other sources. ^ See, e.g., local t-shirt for sale; Chris Rohmann, "Stage Struck: Silent But Deadly", Valley Advocate, Oct. 20, 2011; and "Living in Western Massachusetts", Pioneer Valley Cohousing (last visited Sept. 16, 2012). ^ Carpenter, Edward W. (1896). 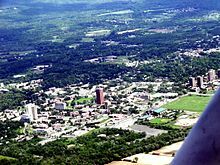 The History of the Town of Amherst, Massachusetts, pp. 1-2. Press of Carpenter & Morehouse.